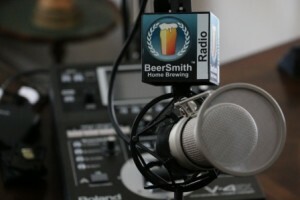 Today my guest is Ken Schramm from Schramm’s Meadery. Ken has been making mead since 1987 and is a founder of the Mazer Cup who has won many awards for his meads at the national level. Ken is also author of the book The Compleat Meadmaker (Amazon affiliate link) and now runs a meadery that arguably makes some of the finest meads in the world from fresh honey and whole fruits. Ken shares a bit about his involvement in the resurgence of mead making in the US after it was again legalized, as well as the founding of the Mazer Cup international mead competition. Finally Ken shares his journey from television production to professional meadmaking and the launch of Schramm’s Meadery which happened about three years ago. We discuss the meads Ken specializes in which are primarily big sweet melomels (fruit meads) starting in the 1.140 or even much higher range of gravity. Ken shares how he manages to get really tart fruits like black currants to counterpoint the residual sweetness in honey to make some of his amazing meads. We discuss his headline mead “Heart of Darkness” which is a unique combination of tart cherries, black currants and raspberries. Some of his other unique tart-sweet meads include his blackberry and black and red currant meads which are very difficult to properly balance. We talk about working with almost equal quantities of fruit and honey as well as some of the special challenges that come with making mead using whole fruits. Ken provides some tips for home brewers working with real fruit, including its use in the primary or secondary. We discuss nutrient schedules which play a critical role in modern mead making, and Ken’s preference for the older DAP nutrients over modern additives like Fermaid-K and Fermaid-O. He shares his closing thoughts and advice for home mead makers. Thanks to Ken Schramm for appearing on the show and also to you for listening! Just watched this interview tonight. What great insights you were able to glean from Ken. I was surprised, however, that he doesn’t follow the various SNA routines, and preferring to use DAP right from the get-go. Does that mean he “repudiates” his yeast fermentation article? In that, of course, he recommends stepped additions and the use of Fermaid K.
Regardless, it was a great interview and a lot of information was shared. I plan on listening to it at least once more, and probably twice. Thanks for a great interview.